Sunny spots on the balcony, sand beneath your bare feet and a cool dip in a refreshing swimming pool are all places you might find yourself when you vacation at Crescent Towers West. The amenities at this second-row North Myrtle Beach vacation rental give your family plenty of options when it comes to recreation and relaxation. Crescent Towers West is a charming North Myrtle Beach resort that is right across the street from the Atlantic Ocean. It seems the only thing that separates your family from the beautiful beaches is a sparkling blue swimming pool. Make reservations to spend your North Myrtle Beach vacation at this beautiful North Myrtle Beach resort and enjoy the spacious accommodations, on-site amenities and close proximity to the North Myrtle Beach area amusements and attractions. Crescent Towers West boasts three-bedroom North Myrtle Beach vacation rentals. 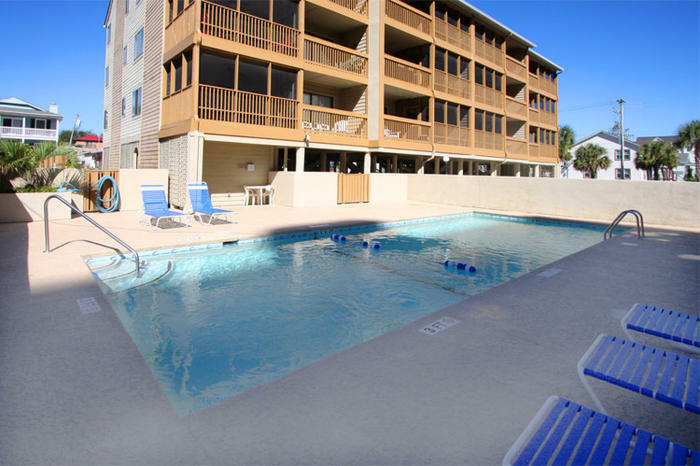 Each of these North Myrtle Beach condominiums has two baths for your convenience and these North Myrtle Beach rentals can sleep up to eight people. What is most unique about this North Myrtle Beach resort is that each of these North Myrtle Beach condo rentals features a balcony and a screened porch. From the living room of the North Myrtle Beach vacation rentals at Crescent Towers West is access to the screened porch. And from the master suite you can access the balcony. Both areas are furnished so you can sit down and relax and admire the sounds of the sea that waft across the street. Both give you the opportunity to get some fresh air while you keep an eye on the swimming pool activity. From the comfortable living room and the accommodating dining area to the kitchen that has it all, everything you need for a delightful North Myrtle Beach vacation is right at your fingertips at Crescent Towers West. The kitchen is fully-furnished with full-size appliances. There is even a dishwasher in each of these condos in North Myrtle Beach, South Carolina. There are multiple televisions and DVD players in these North Myrtle Beach vacation rentals. The washing machine and clothes dryer are wonderful amenities to have in the privacy of your North Myrtle Beach condominium rental. Everything you are accustomed to having at home you will have at Crescent Towers West, plus you will be right across the street from beautiful Atlantic Ocean and inviting white sandy beaches. Walk across the street with a beach tote filled with books and magazines and spread your beach towel out on the sand or set up your beach chair and beach umbrella for a day in the sun. The waves crash ashore and the rhythm can put you to sleep. Go for a swim in the warm ocean water and wade out to the sand bar at low tide. Taking long walks on the beachfront is more than good exercise. When you are enjoying a North Myrtle Beach vacation it is a good way to look for seashells that can go home with you. If you like spending time on the beach then you will love visiting the nearby Cherry Grove Fishing Pier, riding Sea Doos in the Atlantic and going for a bouncy banana boat ride with the kids. There are dolphin watch cruises and parasailing operations around town. Go out to the beachfront early one morning and watch the oceanfront sunrise before you engage in all of the nearby North Myrtle Beach amusements and attractions. Shopping and dining are just around the corner from Crescent Towers West. Outlet malls, charming shops, beachwear stores and more dot the North Myrtle Beach landscape. And there are more restaurants than you can imagine in the Myrtle Beach area. Finding fresh seafood on the menu is the easiest thing to do during your North Myrtle Beach vacation. Seafood buffets line Restaurant Row and Japanese steakhouses are popular venues for dinner, too. Whether your family wants barbecue, Lowcountry specialties, sizzling steaks or delicious burgers, there are restaurants around Crescent Towers West to suit your family’s needs. There are also numerous live entertainment theatres in the Myrtle Beach area. Enjoy everything from a live concert by your favorite artist at House of Blues to a Broadway production at the Palace Theatre. Carolina Opry and Alabama Theatre are locals’ favorites while Medieval Times and Pirates Voyage are dinner theatres that the whole family can enjoy. When it comes to golf, Myrtle Beach has a handle on this sport. There are more than 100 Myrtle Beach area golf courses. Make a tee time at one or more of these beautiful locales and marvel at the natural beauty of our golf courses. At the end of your 18 holes, take it easy at the clubhouse where you will almost always find a lounge or restaurant that serves cold drinks and delicious food.